Luxury seaside accommodation at Nelson Bay. The sea has a great way of soothing the soul and Peppers Anchorage Port Stephens is the perfect seaside escape, with a waterfront position and rooms featuring private balconies and stunning views. Nestled between rugged bush and sea, the Peppers Anchorage boutique retreat offers luxury seaside accommodation in the beautiful New South Wales region of Nelson Bay. Wander around the retreat’s marina and check out the action among the yachts and fishing boats. Take a cruise around Port Stephens bay, explore the waterways by sea kayak or visit one of the nearby surf beaches. With 80 luxury guestrooms, Peppers Anchorage is large enough to provide great guest facilities but small enough to retain an intimate, relaxed and friendly atmosphere. From your private balcony or veranda you can take in the fantastic sea views, breathe in the clean sea air and feel the salty breeze. Enjoy the freshest local seafood at Merretts Restaurant and finish it off with a nightcap at the Captains Bar before you retire to your accommodation. 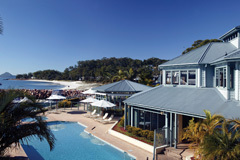 With a range of flexible meeting rooms, Peppers Anchorage Port Stephens offers a unique seaside venue ideal for conferences and executive retreats. Furthermore, the host of leisure facilities includes swimming pool, volleyball, billiards, gymnasium, bike riding and pampering health and beauty treatments. Built around a private marina in the style of an up market yacht club, the 80-room resort prides itself on its intimate atmosphere, professional service and international cuisine. Importantly, Peppers also has decent rooms. The sort you actually want to spend a couple of days in – with comfortable sofas, a decent television and a huge bed…Places like Peppers Anchorage, offer the ideal solution – high end resorts in secluded places, but with plenty of natural attractions on the doorstep. Peppers Anchorage Marina provides a perfect launching point for the delights of Port Stephens and the Myall Lakes. You can charter a boat and cruise one of Australia’s most beautiful natural harbours. Without even leaving Peppers Anchorage there are a host of leisure facilities including swimming pool, volleyball, billiards, gymnasium, bike riding and pampering health and beauty treatments. You can wander along the adjacent white sandy beach or do nothing but relax in comfort and style. Wander round the marina or charter a boat and cruise one of Australia’s most beautiful natural harbours. Unwind, de-stress and rejuvenate with a pampering massage, facial or body treatment using our luxurious Algologie marine plant range. Cycle round the local area. Bikes are available for hire from reception at a cost of $11 per hour. Take a swim in our heated outdoor swimming pool or relax in the spa and sauna. Sunbathe, swim or wander along the white sandy beach next door to Peppers Anchorage. Play billiards, relax by the fire or simply take in the stunning views from our guest lounges. Peppers Anchorage at Corlette is the ultimate Port Stephens retreat, with a waterfront position and rooms featuring private balconies and stunning views.